I came across an interesting post the other day from little house on the urban prairie. It had a lot of the pests I’ve encountered over the years and a new one: the Japanese beetle. The photo caught my eye because I’d come across it the other day when I pulled up my collard greens that had signs of cabbage worm damage. It came up from underground when I pulled up the plant and disappeared by the time I’d come back from tossing it in the garbage. I wasn’t sure what it was. Now I know. 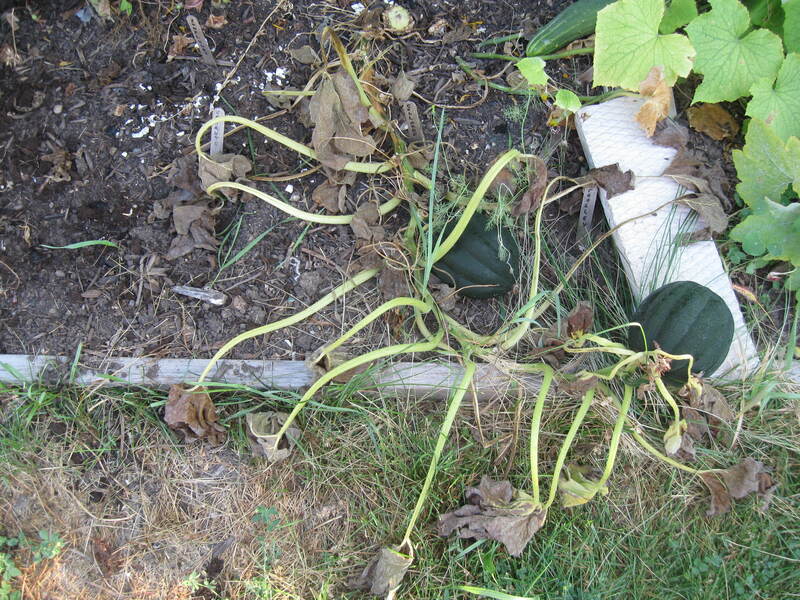 This article from The Old Farmers Almanac talks about how they emerge from the soil in June and start attacking plants. They attack over 300 types of plants! It says to look for signs of leaves where only the veins remain (skeletonized) as a telltale sign of Japanese beetles. Can’t say I’ve seen evidence of that type of damage. Signs of cabbage worm damage on my collards. 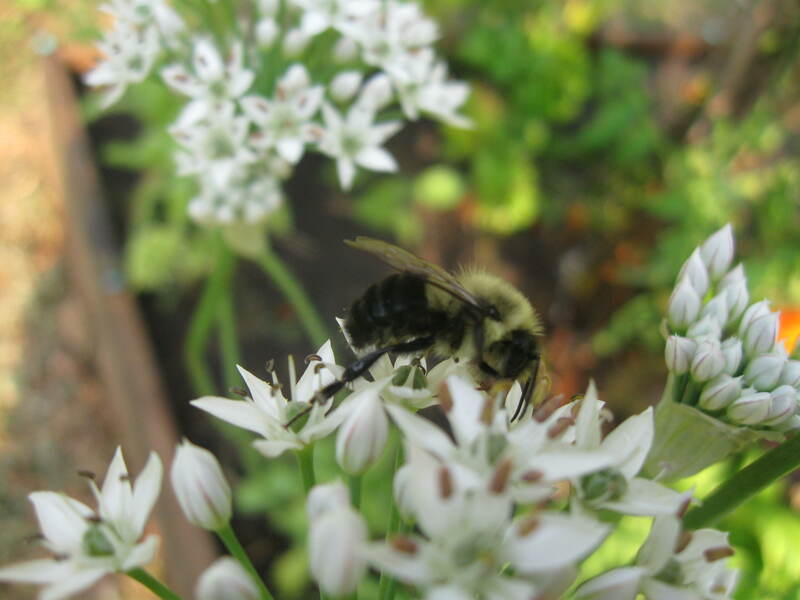 The article on beneficial insects referenced in the one about Japanese beetles reinforced what I often think about and aimed to do this year — plant flowers early to attract beneficial predators to keep the pests at bay. I think my problem is that I try to do most things from seed so they don’t flower early enough. Calendula came up early from overwintering seeds. They didn’t start flowering until June. 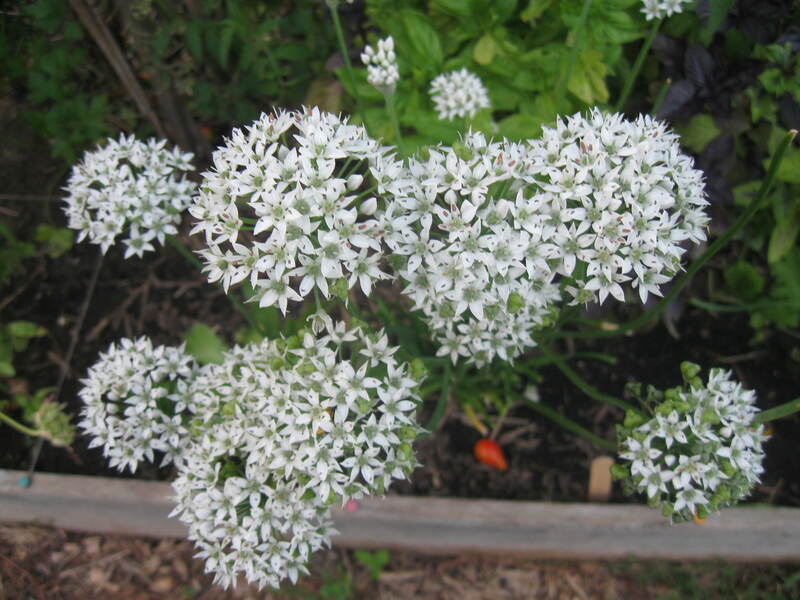 It crossed my mind already this season that next season I should take a break from veggies and just plant flowers and herbs in hopes that any pests overwintering in the soil would go somewhere else. It’s frustrating, feeling like you’re doing all the right things and still having pests invade. I guess I still have some work to do. I’m spending the next two weeks as a resident of Hamilton. I’m really looking forward to walking to and from work (have done it for two days already and it’s been great!) and no commuting to Toronto for two weeks – woo hoo!!! This will also give me good insight into what it’s like to live here. 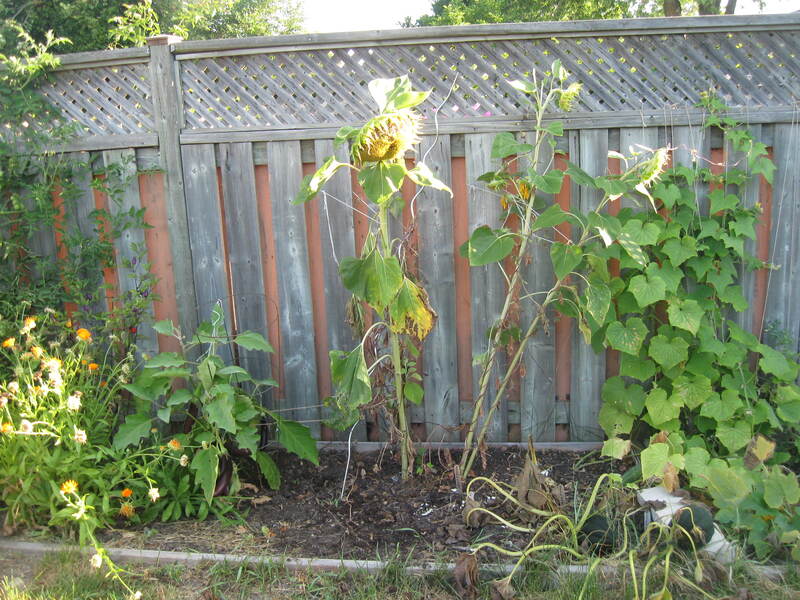 Planning to spend a lot of this time in the garden, cleaning up the summer mess and planting for the fall. Some interesting sights in the garden right now: it seems my relatives have been lax with the watering. The plots are dry as a desert. As a result the greens I planted on my last visit (spinach, collards, kale) are nowhere to be found. I guess I should cut them some slack. They’ve been more focused on preparing for their trip to England. The garden minus all the beautiful morning glory. 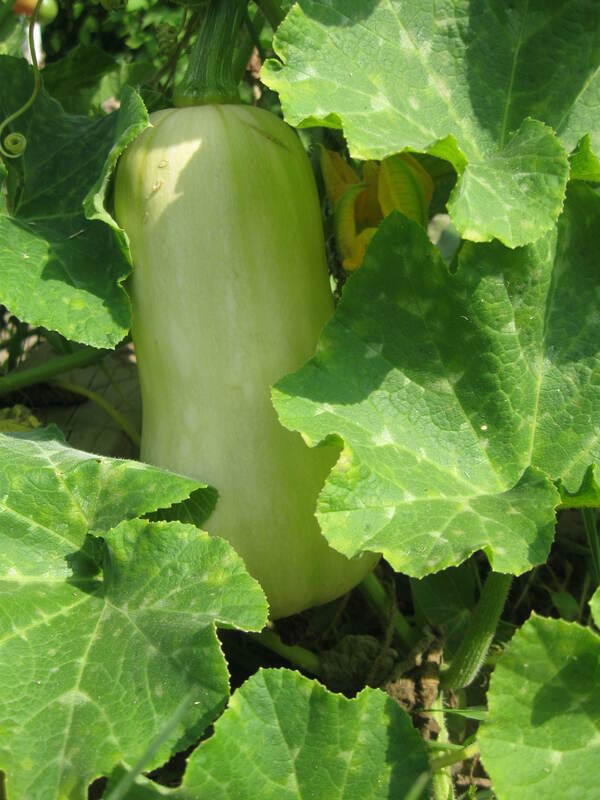 Acorn squash plant is near death but the fruits are looking good. How are they still thriving?! 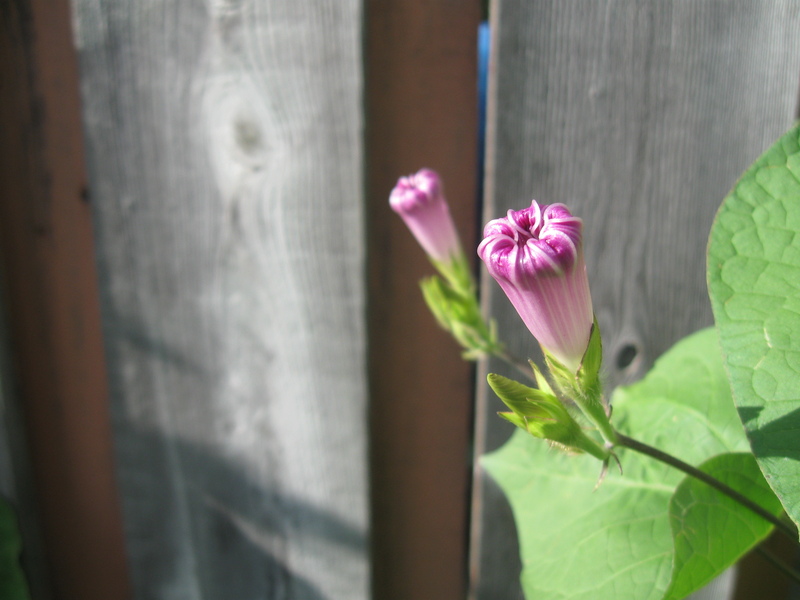 Also noticeably lacking are the beautiful purple flowers that were climbing the fence. I thought were the precursor to beans (silly girl). 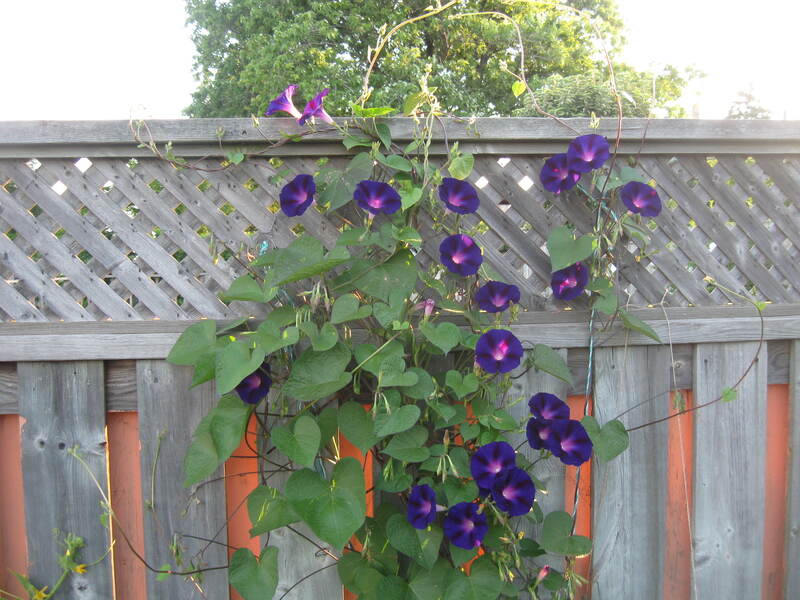 Turns out they were morning glory. Really beautiful but difficult to get rid of once they’ve settled in. 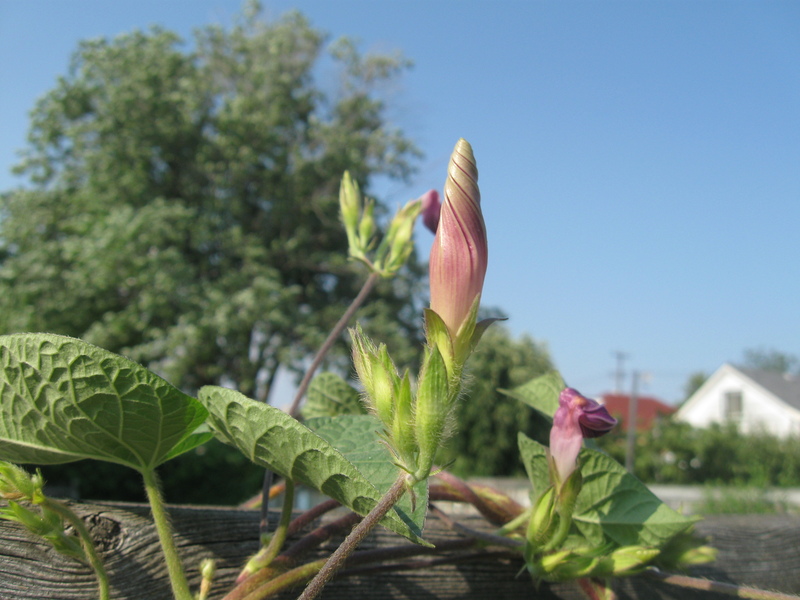 Both my aunt and uncle have talked at length about the problems they had trying to remove morning glory from their front flower garden. I personally don’t see what the problem is. I think they’re beautiful! Whether they’re closed for the evening or open in the morning, they really are eye-catching. What a sight! I don’t think they caused any real harm, except maybe competing with the sugar snap peas (they are doing quite poorly actually). When you’re this beautiful, how can anyone stay mad at you for long? My edible flowers are starting to go to seed. I should start harvesting before I lose them in the soil. Seeing them makes me mourn the fact that the borage seeds didn’t take. What a loss. What a bounty from just one calendula flower! How many seeds can you count? My uncle’s side of the garden is looking pretty good. 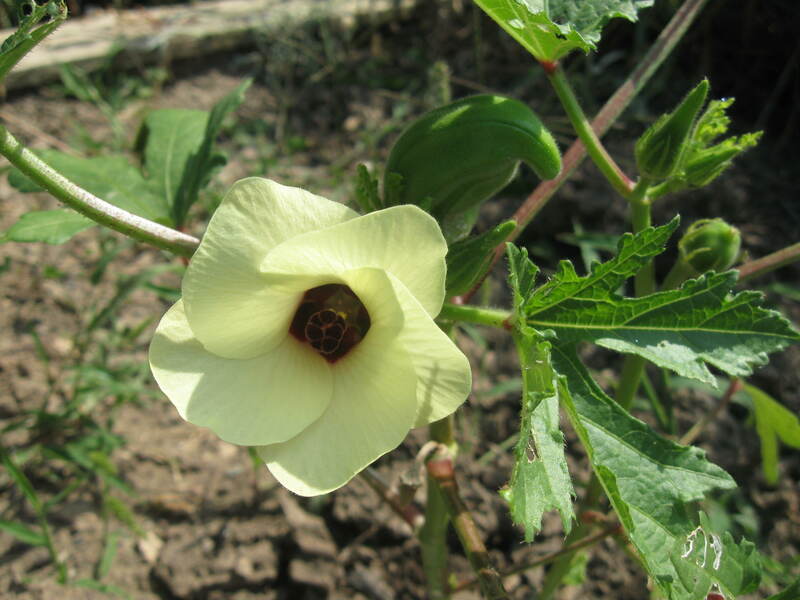 The many okra he planted are finally starting to produce fruit. 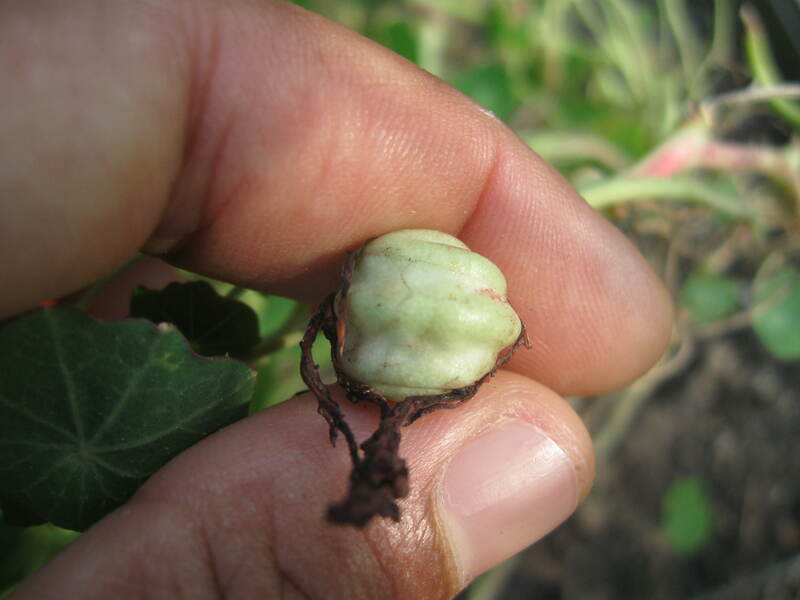 I searched a few blogs and apparently you should harvest okra when it’s about 4 inches or pinky size. 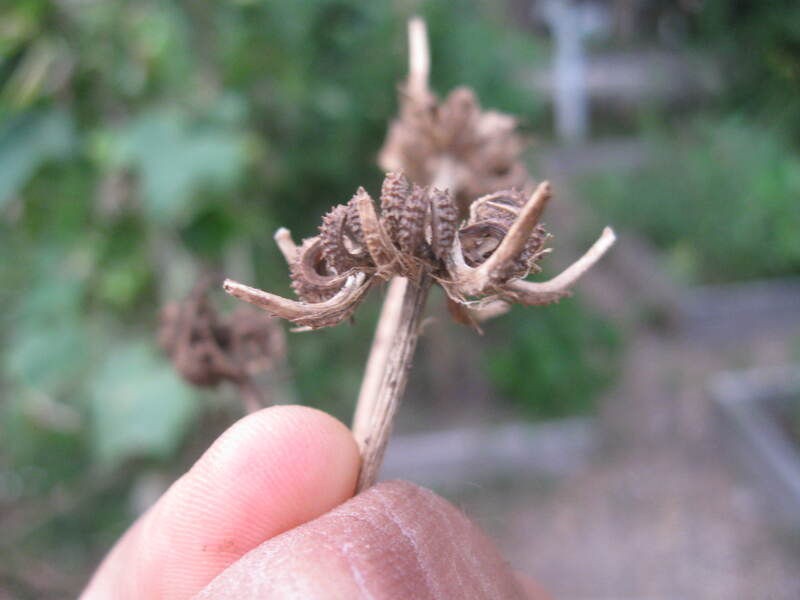 Test okra’s readiness for picking by either cutting the tip with a sharp knife or trying to break it off. If it cuts/breaks easily, it’s nice and tender for eating. If it’s tough, then add it to the compost. The more you harvest, the more it will produce. I think the one in the picture above is ready. 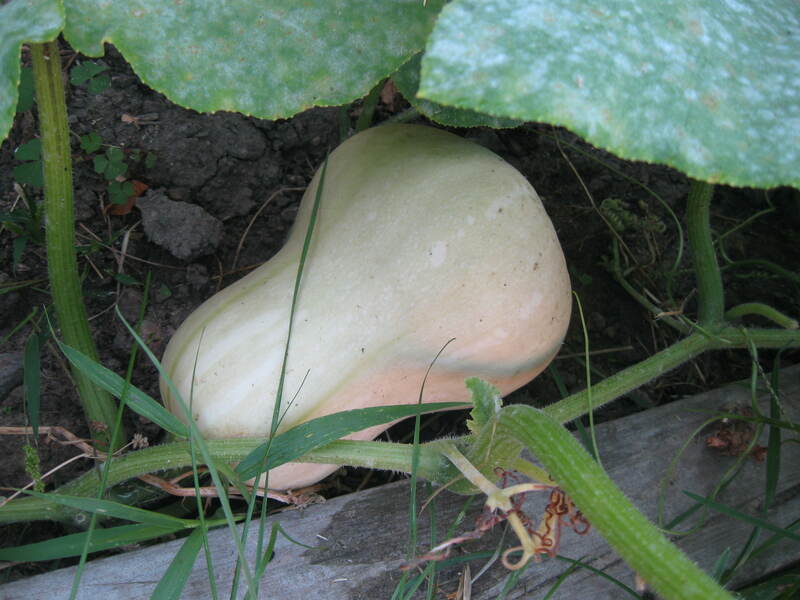 And he’s got a couple of butternut squash hiding out as well. I have one butternut squash that’s coming along nicely and I noticed the other day that I have another one coming along on the other plant! There were two tiny ones also growing on this plant but they died. 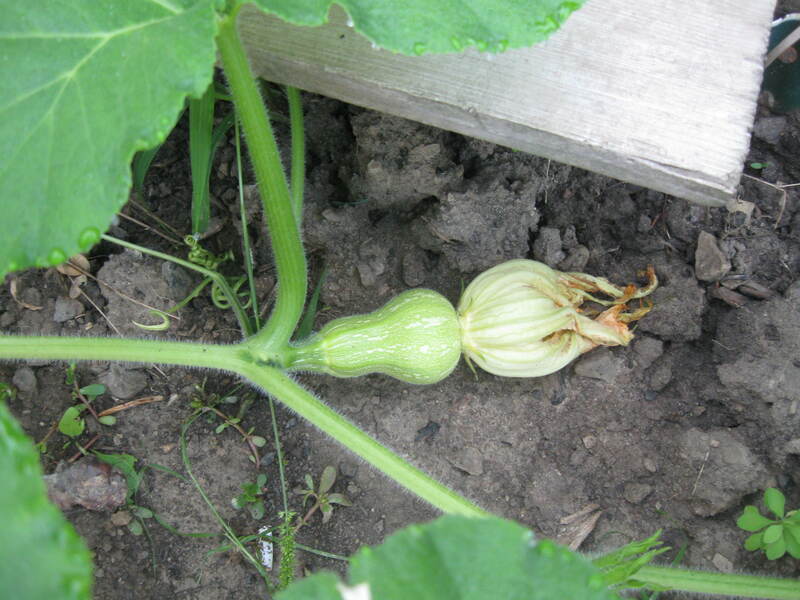 New squash at the back of the garden. 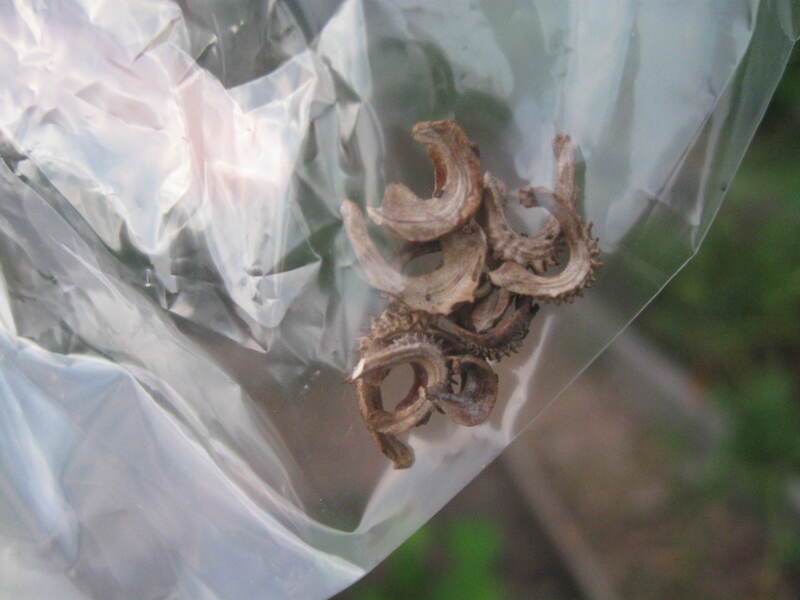 My seed packet says they take 100 days and I read (somewhere) that you can harvest them once your nail can break the skin. Ooo, can’t wait to make my favorite butternut squash soup recipe with it! Quickly ran by the garden before meeting up with a friend for dinner at Guu Sakabar. I had about 15 minutes to assess what was happening and harvest whatever was ready for eating and for storing (ie. seeds). The zucchini was putting out a few blossoms but not making any fruit. It’s starting to go down to single digit temperatures overnight so I’d be surprised if any fruit actually produces. 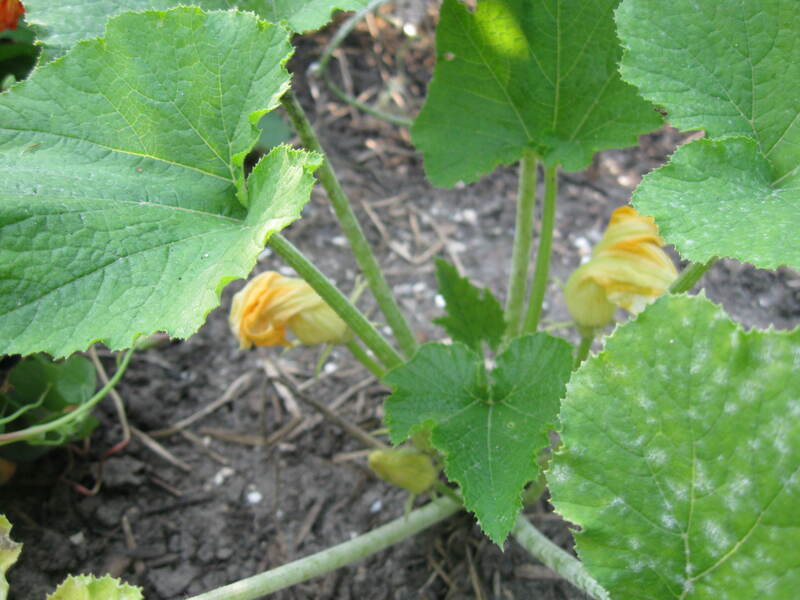 I hope more blossoms continue to bloom so I can try making a stuffed zucchini blossom recipe. 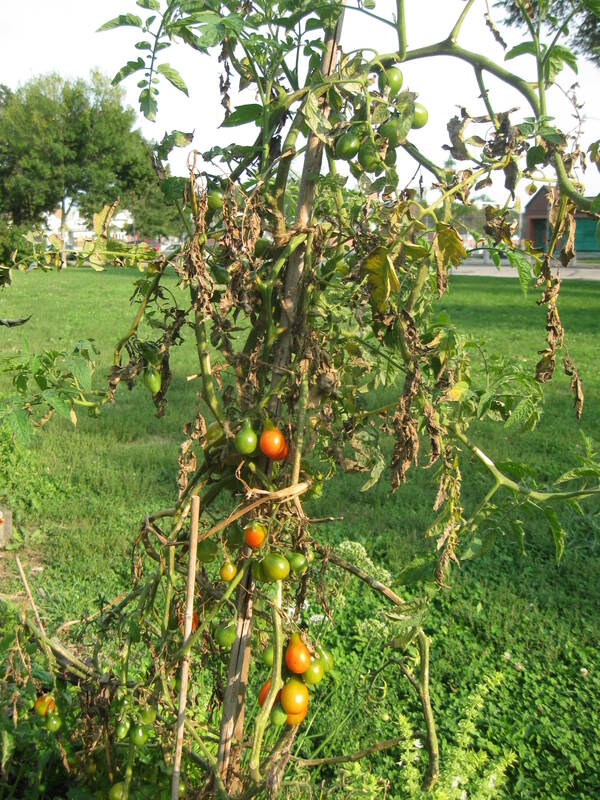 The tomato plants continue their natural decline but I’m happy to say that energy is being put into ripening the fruit. Parsley and dill are getting stronger. 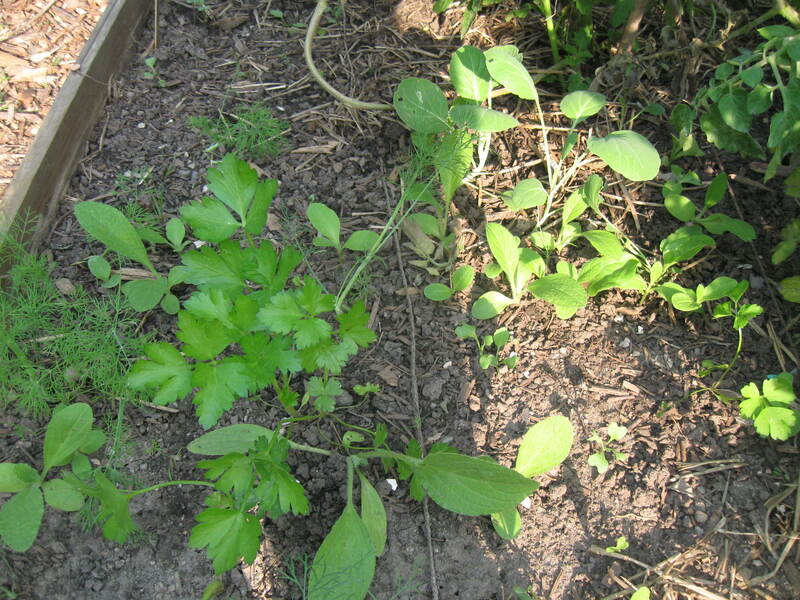 I’m not sure what the oblong-shaped leaf near the parsley and dill is. It doesn’t look like the collards near the back of the photo. 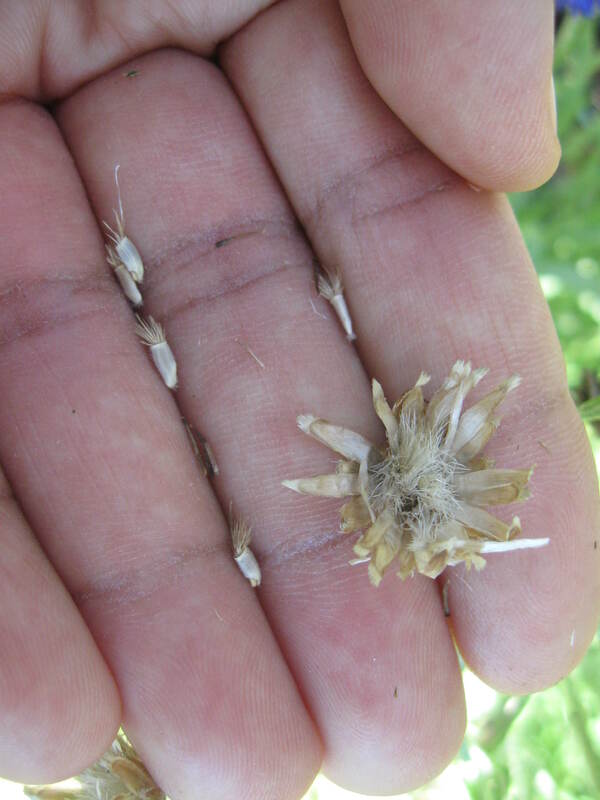 This chive flowers were closing up and starting to make seeds. I was tempted to pick the buds but decided to leave them. 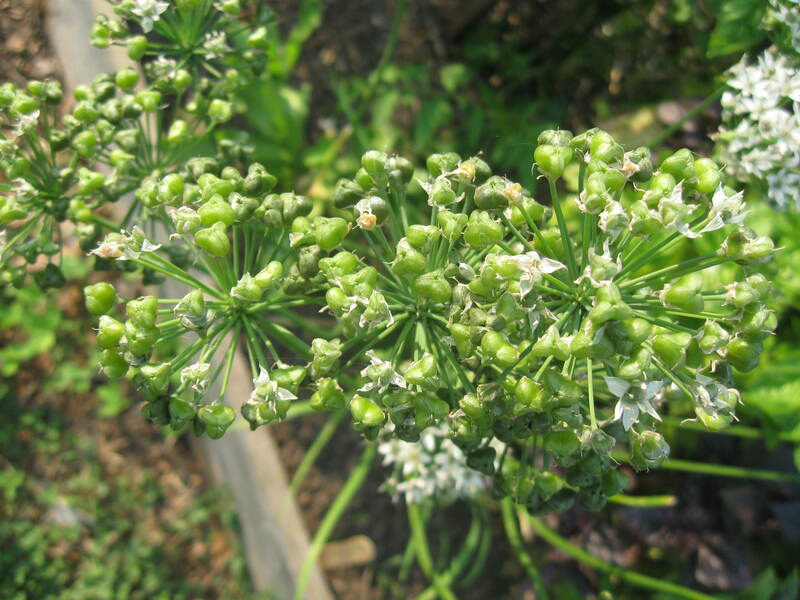 A post on saving garlic chive seeds on the Garden web forum told me that, much like with other seeds, it was best to wait for the seeds dry on the plant before picking them for storage. I wonder if they taste any good like this? 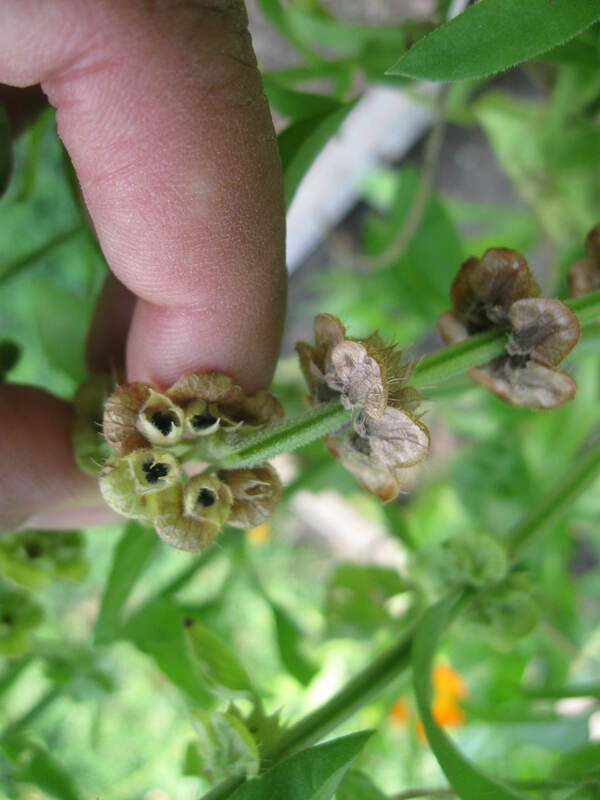 I’ve noticed for a while that the basil were going to seed and recently discovered that the seed pods are actually underneath the flowers. I had to turn the plant upside down to find them. 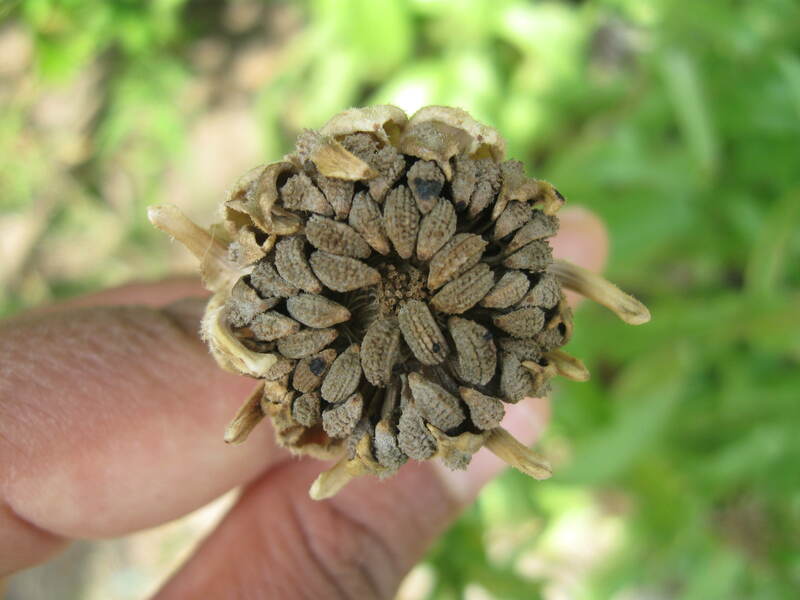 I gently picked off the dried flowers and managed to separate some seeds from the pod. I’d soon run out of time so I quickly picked a few more dried basil, calendula and cornflower flower heads so I could remove the seeds at home. On Labour Day, my brother and I headed up to Mel Lastman Square for the Hispanic Fiesta. It was our first time attending the festival. We were going to see Imbayakunas, who are always entertaining (we went to the Beaches Jazz Fest just to see them), but we were delighted to find that the entire show was amazing. My brother really enjoyed the Mariachi Viva Mexico band, in particular. We had such a good time. It was a great way to end off the summer on a high note. It was quite clear though that summer was over. Somewhere during the performances we realized that it had become pitch black all around us. I looked at my watch, expecting to see that it was at least 10 o’clock, and was surprised to find that it was only 8:30! The days are becoming shorter. Adios verano (bye bye summer). I’ve been passing by the gardens for short periods of time these days, really to collect seeds. I planted some beets, carrots, kale, spinach and collard greens at the end of August. We’ve had a few downpours so we haven’t had to water as much. I noticed that a week after I planted the beets, they were already starting to come up. This time my brother picked up Early wonder tall tops from Urban Harvest at Dufferin Grove Farmers Market. According to the description, these are the type you’re supposed to buy if you like to eat the greens. I’m really looking forward to trying them. Too bad they take a month and a half to two months to reach maturity. The carrots are coming up too but they take just as long. I’m not sure which I enjoy better – the gustatorial delights of the closed blossoms sprinkled on my meals (oh man, so good!) or the visual delight of the flowers in full bloom. I personally don’t think they taste as good when they’re in full bloom. I’m interested in seeing what it will be like to collect the seeds. I haven’t been successful in finding nice looking seeds under the plant itself. The green ones I found on the plant. I wasn’t sure about the viability of the white, wrinkled looking ones (or if they were even seeds at all) so I squished one between my fingers and it disintegrated with some pressure. I left the rest. They really didn’t look like the ones in nasturtium video I found on YouTube.The green ones are drying well at home. 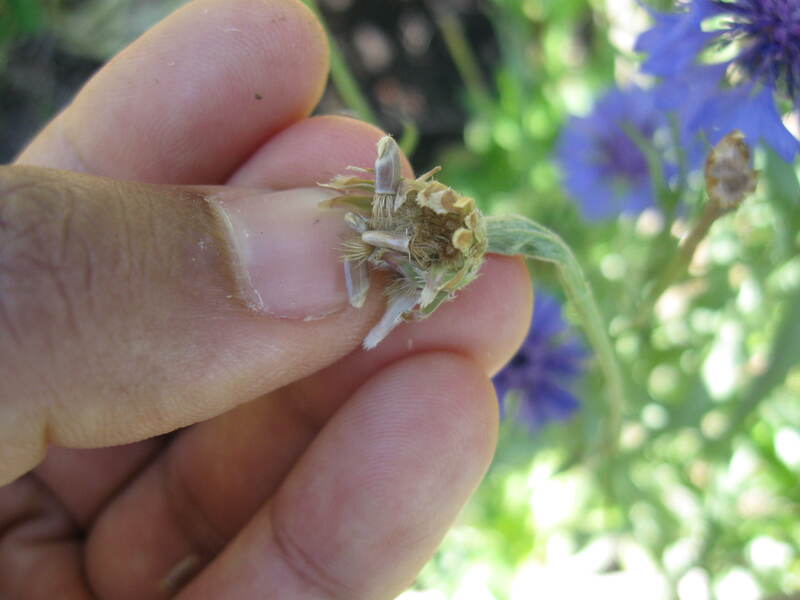 The cornflower seeds are really easy to identify and to harvest. 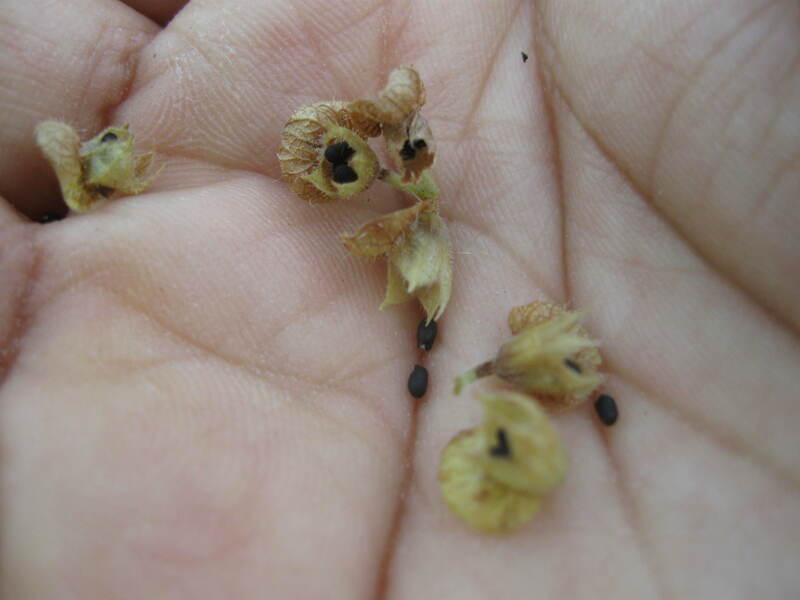 I’ve just been running my thumb inside the dry seed head and the seeds just pop out. 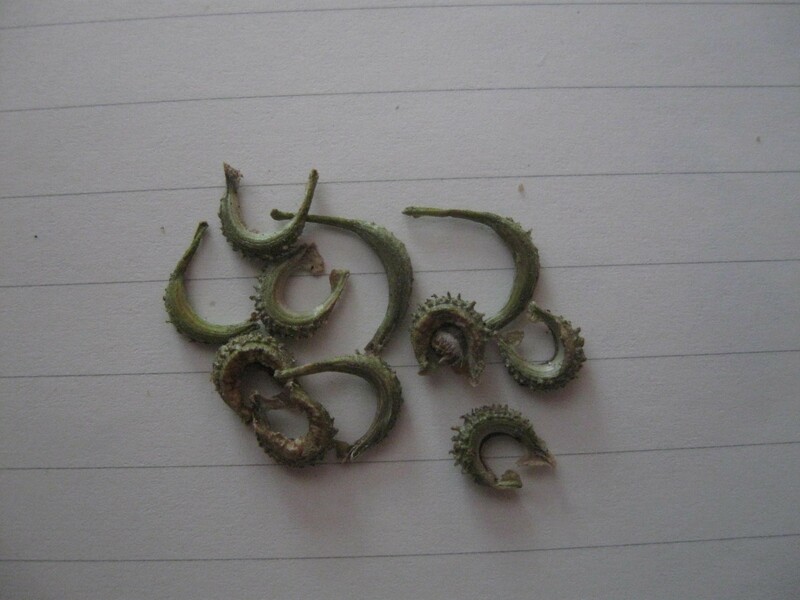 I was doing this in the garden until I found I was losing a lot of them so now I’ve been taking the flower heads and separating the seeds at home. I’ve become more than a little obsessed with the cornflower seeds in particular. 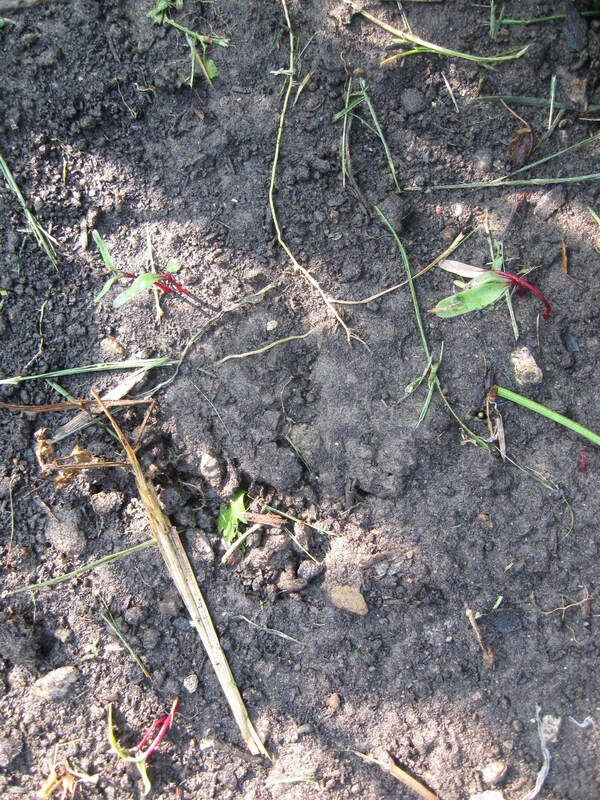 Last week I spent some time searching the ground around the calendula flowers for seeds. I found some this way last month. 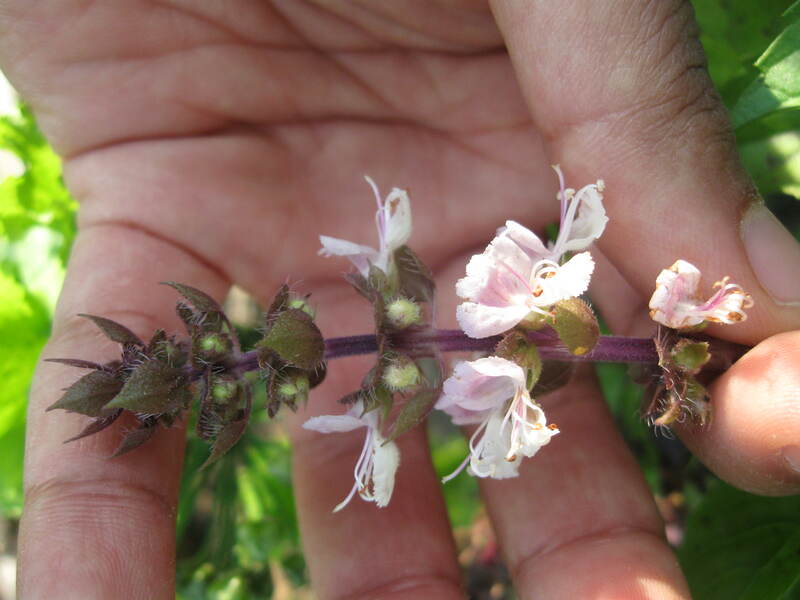 I inspected the flowers and realized that some of them were pretty dry and I could recognize the seeds! I was too impatient to take the dried flowers home and hang them upside down in a paper bag so I picked off the seeds and took them home in a baggie to fully dry before I store them. Bag ’em and head for home! The end of summer is not such a bad thing after all! 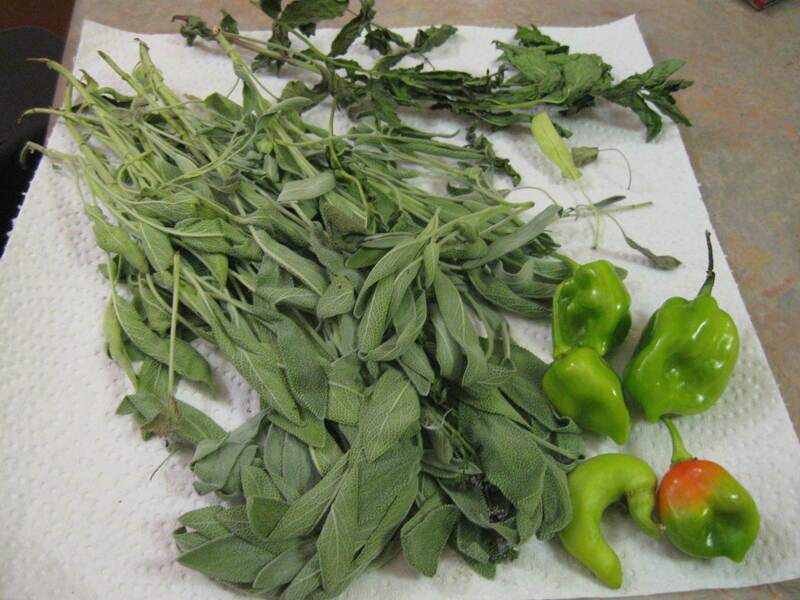 Visited relatives last weekend and came back with some sage, mint, and hot peppers from their garden. I’m using the mint and sage for tea and I’m trying to save the pepper seeds for next year. 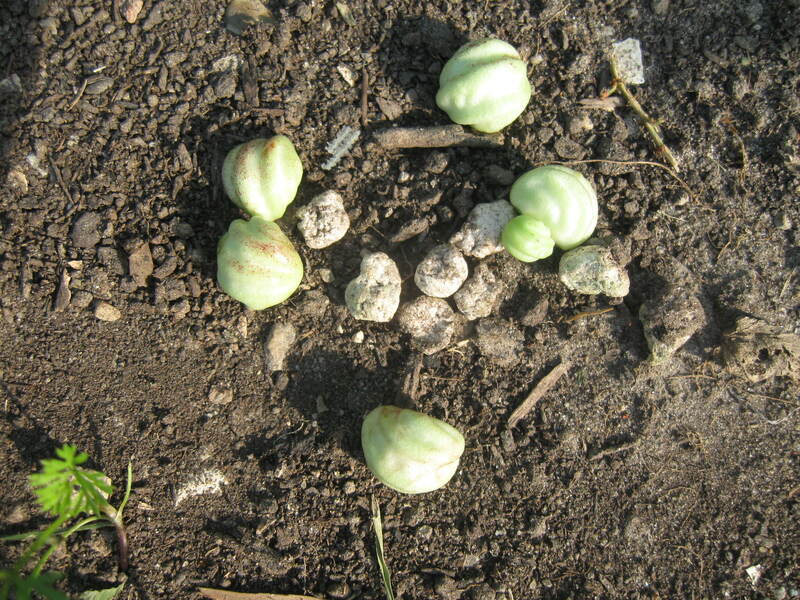 What I’ve realized after reading articles on the subject, particularly the Seed Saving Instructions for Beginners and the Vegetable Seed Saving Handbook , is that the fruits must fully ripen on the plants before the seeds can be harvested otherwise they may not germinate. 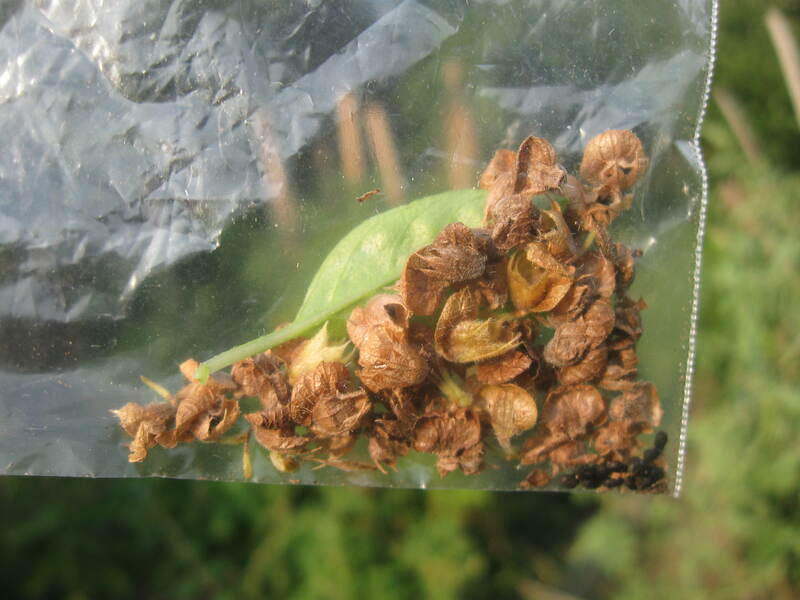 I had been drying seeds from a green pepper, not a fully ripened red one, and it did not ripen on the plant (obviously). I tossed them out today and after washing my hands, forgetting I had been handling hot pepper seeds, I began to rub my eye. Big mistake! My eye swelled and burned like mad. Without thinking again I put water on my eye, which made it burn even more! I should have remembered that drinking water after eating peppery food just makes things worse. I did eventually recall what helps to soothe the pepper burn – milk! I put some milk in a cupped hand and rubbed it on my eyelids and the swelling began to go away immediately as did the burning. Pfew! 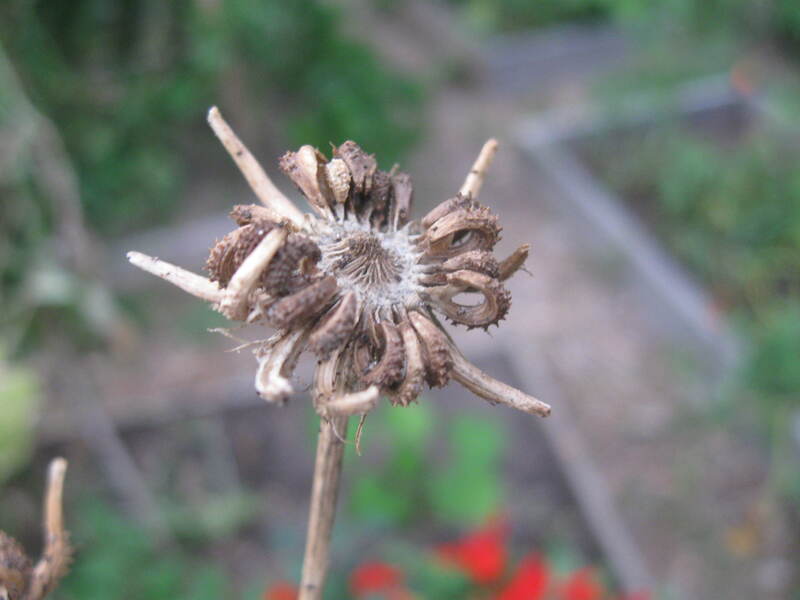 The other day I was surprised to find some calendula seeds just lying around in the plot, near where the borage plant used to be. So I gathered them up and I’m making sure they are fully dried before I package them for next year. 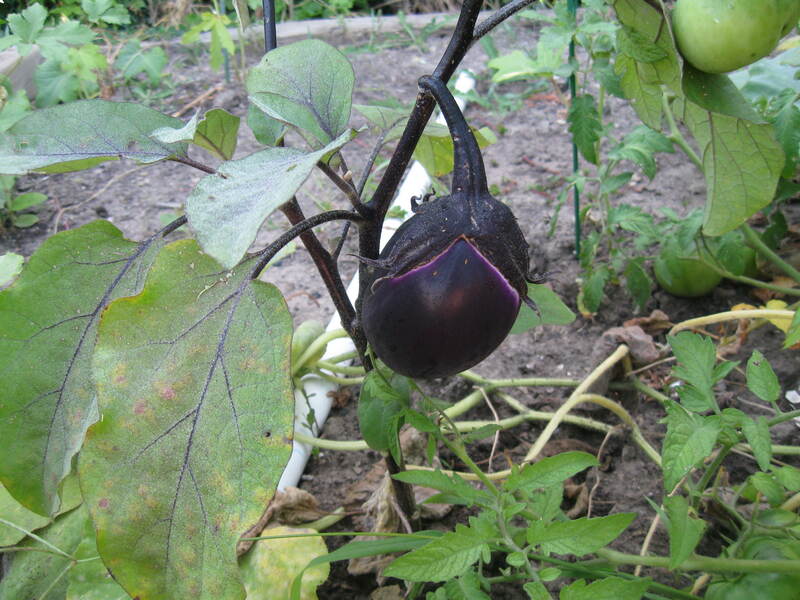 I read in an eHow article that seeds that fall on the ground can be moldy and can get wet (which makes they nonviable for saving). I’d still like to try growing them so I think I’ll separate them into another package, rather than putting them in with the seeds I bought from Urban Harvest. The soil was very dry when I found them so I’m hoping they are still OK. 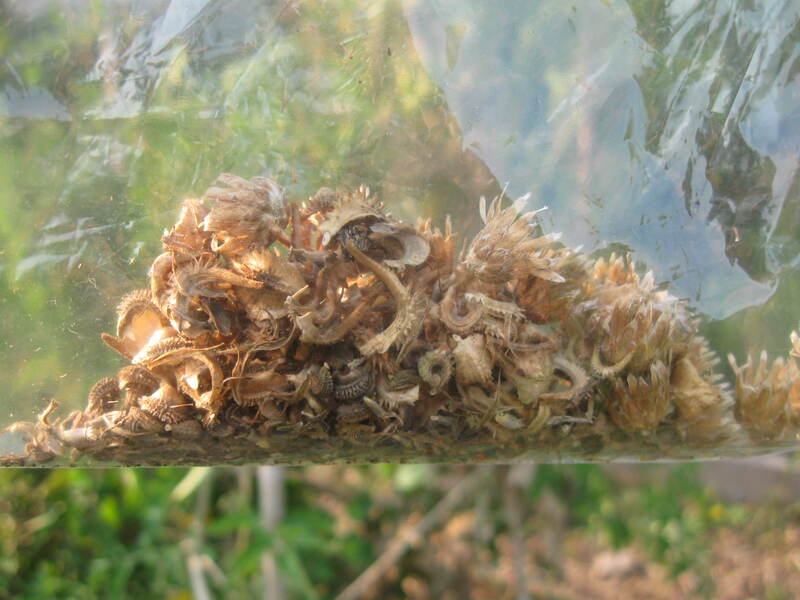 So now I’m thinking more about harvesting flower seeds for next season. I’ve been admiring the yarrow in the community plot all summer. I’ve been reading lately about the benefits of yarrow as a companion plant. 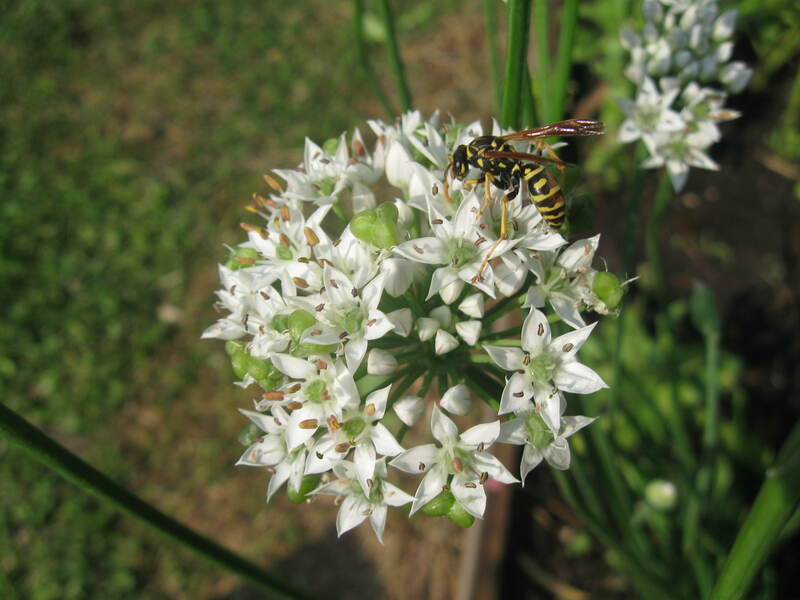 According to wikipedia, it attracts predatory wasps and ladybugs, improves the soil, and improves the health of plants that are grown nearby. 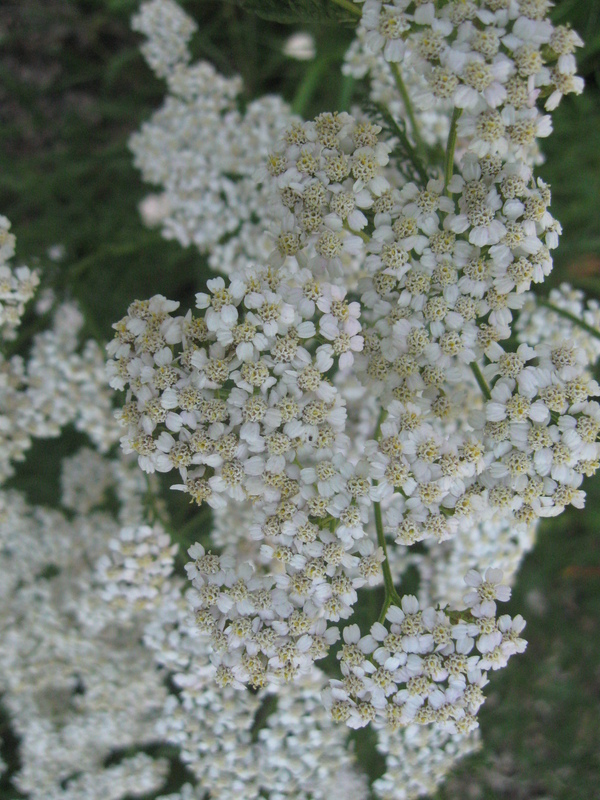 eHow also gives some other useful information about yarrow. It apparently takes 2 years to become established, which is a bit of a bummer. I helped myself to some drying flowers just off of the community plot and I’ve placed them in a paper bag to fully dry. You can shake the bag to try and separate the seeds from the chaff before you store them. 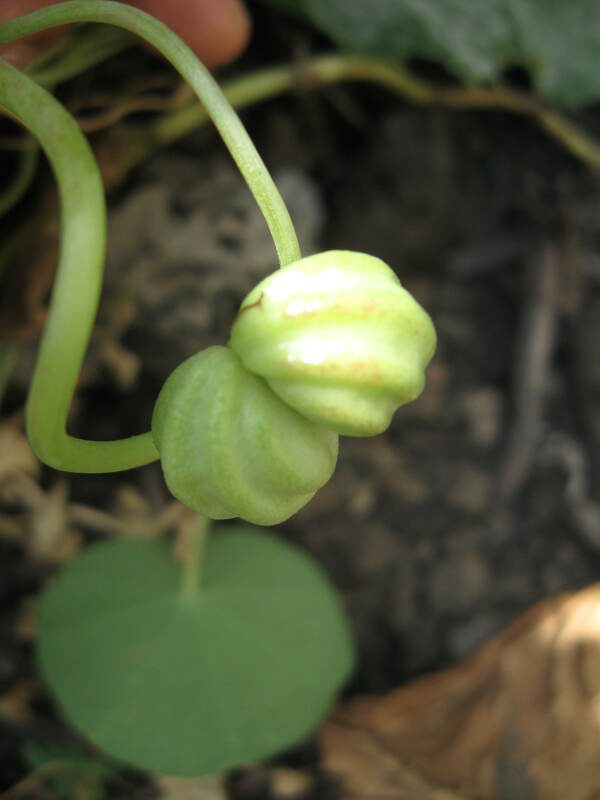 I saw an interesting video on Youtube today about collecting nasturtium seeds. I’m going to be looking for these on my next visit to the garden!